I have this tree which has thick shiny leaves, and which was first introduced to me by the plant/tree supplier in the Philippines as "Cassandra", easily bringing to mind a movie "Cassandra Crossing", a junction or train route where disaster was bound to happen. And if my Greek mythology reading is right too, Cassandra was a host of diseases, strife and misfortune let loose into the world by a little girl not knowing its nature as such. With that as background, I had the creeping and silent scare that by its name it bode of bad luck. The next time I was introduced to it by another plant supplier, it had a different name "Benito", meaning good, if my Spanish is right. Since then, about six or seven years ago, I began growing Benitos, not really planning to make a bonsai but intending to propagate or make it grow in numbers - to multiply good luck! I have a good number growing now, from a single tree/plant which is now maybe six to seven years old. I water them everyday, once in the morning and again late in the afternoon or early at night (twilight?) when I have the time. Recently, I had my patches of earth by the front and side of our house landscaped by someone who is either a professional landscaper or a landscaper by occupation, and she described this tree as having been made into a bonsai. That process happened by accident, as I customarily cut the branches and planted them for propagation each time the branches looked healthy enough to plant. 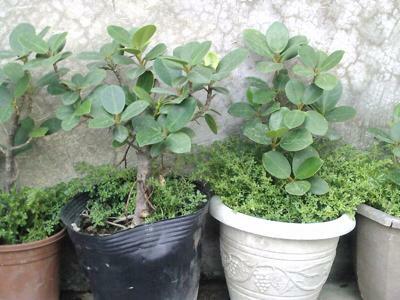 Now, I have a clear idea and purpose for growing these Benitos as, or by way of, bonsai (The "bonsai way"), and give the best little old trees to my grandchildren in the very near future as my gifts to them, and to sell the excess for my business. I have yet to take pictures of them though and upload them so you can take a look. However you will describe them, from your professional point of view and learned eye, they will always look good to me. Thank you for your very helpful and invaluable tips on growing bonsai, or cultivating trees the bonsai way. By the way, my grandmother's name is Benita, but she has already passed away at an old age, and she was a good grandmother to me growing up, whenever we would visit her and my grandpa at their house in a sleepy old town, hearing her tell me about my father as a little boy, and her advice to him when he became a lawyer, not telling me what to do, but sharing her few views about my father, as her implicit way of providing me ideal guideposts in life. I read somewhere, there are no coincidences, just miracles along the way.